Washington: I wanted to make the character distinct from negotiator in "Inside Man"
LOS ANGELES, California (CNN) -- Denzel Washington's new movie, "The Taking of Pelham 123," is not a remake, even though Walter Matthau starred in a film by the same name in 1974, the actor told CNN. 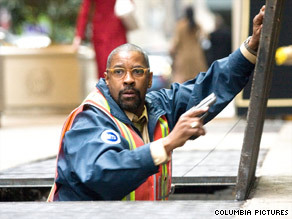 Denzel Washington plays a transit official, once demoted, in "The Taking of Pelham 123." Moreover, Washington's character is not like the hostage negotiator he played three years ago in "Inside Man," although the movie is about his negotiation with a deranged ex-con hostage-holder, played by John Travolta, Washington said. The updated "The Taking of Pelham 123" is a riveting movie about a subway dispatcher confronted by a former Wall Street trader seeking revenge -- not just a ransom, as in the 1974 film -- from the city of New York for sending him to prison. The movie opens nationwide Friday. It's essentially a two-character play, with much of the dialogue delivered over a two-way radio between Washington, in the train control center, and Travolta, on a hijacked train, director Tony Scott said. The drama is paced and punctuated by a dramatic above-ground sequence, including plenty of crashes, as police rush to deliver a $10 million cash ransom before a deadline. Travolta's character is "a contradiction of what you normally expect in a bad guy," Scott said. "He's funny, he's smart, and he's got a big heart." While Travolta, who is mourning the loss of his teenage son earlier this year, did not participate in interviews, he issued a written statement that called his character "the ultimate evil mastermind." "This role as an actor gave me the chance to dispense with all moral and ethical limitations, and explore just how bad this character could really be," Travolta said. Washington said his character, a transit official demoted to dispatcher because he was suspected of taking a bribe, is a new twist on the familiar hostage negotiator role. "I was concerned a little bit about 'Inside Man' where I was a cop and a hostage negotiator," he said. "I just liked the idea when they hand him a gun that he'd never held one before, that he was an ordinary guy in an extraordinary situation and with this cloud over his head. He didn't come to work knowing he was going to get an opportunity to redeem himself." Washington, who looks younger and more fit than his character, said to prepare for the role he "ate a lot and kept getting smaller and smaller sweaters to wear." James Gandolfini's role as New York's mayor is a combination of current and former mayors -- Michael Bloomberg and Rudy Giuliani. While he has Bloomberg's Wall Street savvy, he carries himself like Guiliani on September 11, 2001. New York City is also a major character, Scott said. Many scenes were shot below ground in subway tunnels and a closed down transit station in lower Manhattan, mostly at night, Scott said. It took four weeks of tedious shooting, he said. "It's just a whole other world down there," said Washington. An old train car was rebuilt to accommodate cameras and placed on a sound stage in Queens for scenes that couldn't be shot underground, Scott said. The same person who designed the Metropolitan Transit Authority's (MTA) high-tech control center was hired to build a replica on a sound stage in Queens, he said. Brian Helgeland, who wrote the screenplay, revealed the secret about why he would use an older movie title for a film they do not want seen as a remake. Since Sony Pictures already owned the rights to "The Taking of Pelham 123," it made it an easier sell to the studio, he said. The original film, whose title had the number spelled out -- "One Two Three" -- was based on a best-selling 1973 novel by John Godey, and starred Robert Shaw as the villain opposite Matthau. "The start was using that as a title, something the studio would feel comfortable making rather than just a nameless, orphan idea that you might have on your own, to try to put that together and use 'Pelham' as a springboard to make your own crime movie," Helgeland said. iReport.com: Share your review of "Pelham"
He tried to stay away from the original "Pelham" particulars "but we had the same situation as the core, which was a hostage situation with one guy in the train with the hostages and another guy outside dealing with him over the radio." Putting the movie together, he said, was "a little bit like trying to pull off a heist, putting the pieces together, with a getaway car driver and a safecracker and all that stuff."